Firstly, many thanks to Ian and Richard for trying to help me on this one. However, a visit to the Essex Records Centre provided me with what I needed. I’ve been researching my family history for about 10 years, using stories my parents and grandparents told me, together with facts collected from the various records available. Recently, I’ve been attempting to establish an accurate timeline. My mother Jessica Devine moved to Laindon in 1923 and married my dad, George Burton in 1930. Initially they lived in ‘Spion Kop and my brother Dennis was born in Laindon. There was little work available for my dad at that time so they relied on the savings he had accrued from his time in service as a footman when he was in his teens. However, as that ran out, they became extremely hard up. That’s when my mother asked the woman in the ‘White House’ in King Edward Road if she could do a morning’s housework for a fee of half a crown. She agreed but when mum had finished working hard all morning, the woman went back on her word and only gave her two shillings. When my dad’s mother, Amy Burton heard of their plight, she invited them to go and live with her in Leytonstone. This they did, taking their toddler, Dennis, with them. I believe this was sometime between 1932 and 1934. Dennis started school in London, but the family continued to spend their weekends at Laindon. My Dad joined the GPO in 1937 as a Night Telephone Operator at the International Exchange in Faraday House near St Paul’s. His mother Amy died in 1938. That’s when my mum, dad and Dennis moved to Laindon permanently. Dad did the commute each day on the Fenchurch Street line and Dennis was enrolled at Markhams Chase school. The people at “White House” in King Edward Road, owned a flock of very aggressive geese that used to run out and attack people. (Some farmers used to keep them as watchdogs). Apparently, they were so vicious that people were scared to walk past ‘White House’ on their way to the High Road. My sister remembers on one occasion, seeing ‘Old Joe’ having to fend them off with his white stick when trying to get past. One day my brother ran over one of them (apparently on purpose) with his bicycle when it came charging out at him and afterwards said he was sorry he’d only managed to run over its neck! As nobody seemed to have any knowledge of a White House Farm in King Edward Road, I took a trip to the records office. I looked on the Electoral Rolls for 1922, 1929, 1930 and 1934 and found John and Mary Ann Parker living at “White House”, King Edward Road. (That name tweaked my memory as I remember mum mentioning that family name). 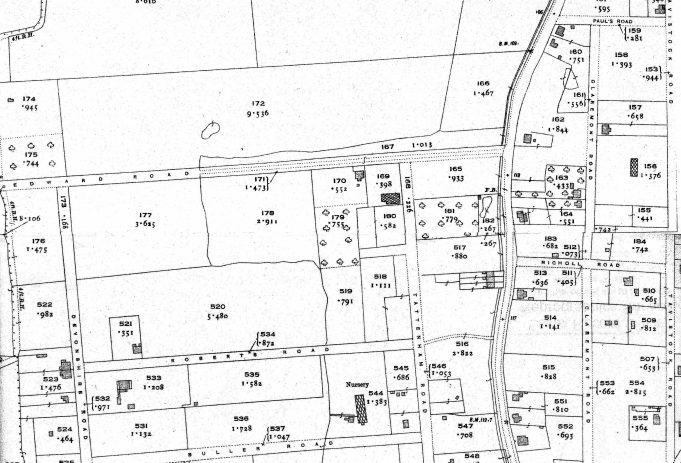 The ERO staff kindly retrieved a 1922 Ordnance Survey map of the area for me, which shows just one building to the east of Devonshire Road in the eastern end of the former playing field. As Richard correctly mentioned, Powell Road wasn’t in existence then. The building clearly had a greenhouse or glasshouses and an orchard on its plot. So this was the ‘White House’ that my mum referred to. I made a phone call to my sister who confirmed it was the place she remembers from the mid forties. She and my mum always referred to it as “White House Farm”. Although it was probably more of a small holding, these were sometimes referred to as small farms and operated as such – hence the flock of geese. On the 1947 Electoral Roll, the building is shown as “White House Farm” King Edward Road. Frank E and Lilian R Griffin were living there at that time. At lot happened during that year. White House Farm was demolished and Briar Mead was built in its place. King Edward Road was a very long unmade road back then, little more than a cart track. My sister remembers it well and says it was divided almost in half by a hedge or some bushes. In the late forties, King Edward Road was made up but only as far as Devonshire Road. The far westerly end of King Edward Road which led to Sunnymead (formerly Richards’ Farm) and our bungalows, Spion Kop, Pendennis, Rosedene, Horton, etc, was left unmade and so we still had to contend with the mud. On their way to school one morning, my sister remembers she and her friend where jumping on and off the piles of slabs which were waiting to be laid, when she fell and cut her knee. She returned home to be bandaged, which caused her to be late for school. I just about remember the field from around that time. It had many bushes and brambles, which were eventually cleared away, after which it became a much loved and appreciated grass-only playing field throughout the fifties. Many members of the Parker family lived in and around Laindon. During the fifties, a large family of Parkers lived in Sunny Mead, the former Richards’ farm and I used to play with the two young boys. I have copies of the 1930 and 1947 Electoral Roll, but cannot publish them here without permission from ERO, however I can show the map. I will continue with my research as there’s always plenty more interesting things to discover. Right now I am so pleased I found confirmation of the existence of “White House Farm” in King Edward Road and as far as I am concerned, they still owe my mum sixpence (plus interest of course). 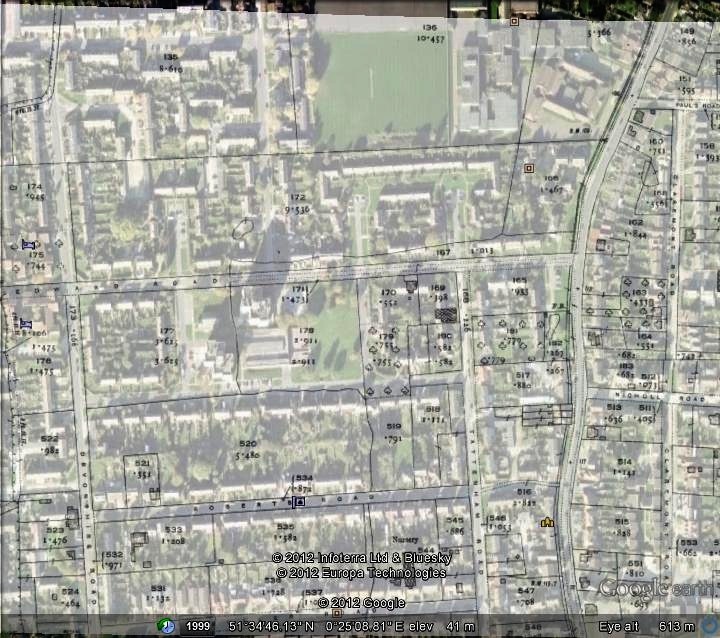 I have been provided with an overlay of the 1922 Ordinance Survey map on the Google earth view and you can with care see the location of the field and the relevant roads. Further recent research has shown that previous to the Parker family, White House Farm had been in the hands of Morris and Sarah Buskin who had moved to Laindon from Bethnal Green sometime between 1915 and 1917. The 1918 Electoral Register shows Morris and Sarah Buskin living at White House Farm, King Edward Road, Laindon. White House Farm, King Edward Road, Laindon. 170 is the house. 169 the greenhouses. 179. The Orchard. Unsure if 177 or 178 was part of it at any time. Hi. Firstly, thank you very much for putting this site on the Internet. We have been trying to trace our dad since 2008. Long story short we have managed to track him down in September this year, his mum was Mary Ann Parker, the daughter of John and Mary Parker who lived at White House Farm! His name was John and he always talked of living in the farm when he was a child with his grandparents and his Aunty Lillian, he went to Markham’s Chase school from 1926 we think, but we don’t know what year he left the farm or why his grandparents left? Would anyone be able to give us any dates? We have a photo of him on the farm and also a Markham’s Chase school photo. Any info would be absolutely amazing and much appreciated! Editor:- He probably started at Laindon High Road School in 1928 and transferred to Markham’s Chase School when it opened in 1933. Alan. Thank you for the confirmation – everything helps. White House Farm was demolished at the beginning of 1947 and Briar Mead was built in its place. The area changed completely during that year. Best wishes. I can confirm Ian’s date of 1947 for the building of the properties in Powell and Tattenham roads. The first houses to be built on the estate were those in King Edward Terrace. We lived in number 2. I watched the King Edward Terrace properties being built as I walked past them every day to and from Laindon High Road school. Progress was very slow and often stopped completely for days at a time as building supplies just after the war were in short supply. January 1947 we finally moved in. We moved to the newly built Devonshire Close, at the beginning of November 1964, my parents now in their 70s, still live there !!! My mum, Sheila Brown, is related to Jack Parker, who had Parkers Stores in Timberlog Lane. Mum lived in Fairview Rd as a girl. That’s brilliant Nina. All your hard work has paid off. Hi Ian. That must be the bushes or hedge my sister told me about that divided the field almost in two. I only have vague memories of that as I was very young and she was 7 years older than me. Hi everyone, now Nina and Ian now you have mentioned a boundary, I can now recall a pathway that ran across the field with bushes either side with lots of nooks and crannies and a mud hill containing lots of rubble. There were also lots a blackberry bushes etc. there. It’s a bit vague because it’s nearly 60 years ago but maybe I can recall it being two fields, please don’t hit me with any mistakes because I am not absolutely sure it’s just in the grey matter somewhere. Nina, a fascinating conclusion to the White House mystery. The 1922 map is the one I looked up and the buildings you refer to are the ones I could see were buried under Briar Mead. Certainly the greenhouses are marked, what a pity the OS didn’t start marking house names until much later. Looking further away from the farm, in the High Road, we can see that the three houses near Pelhams Alley were there in 1922 as was the rather spooky house Fair Natal. No LHR, just Pauls Road leading to nowhere in particular. Such a history there is associated with Laindon, its good to research it. Thanks for this, it was brilliant. Nina, I have plotted the King edward Estate on the 1922 Ordinance Survey Map and the block of housing bounded by King Edward Road, Tattenham Road, Powell Road and Briar Mead, completely occupies plots 169, 170, 179 and 180. It is known that the properties in the block facing Powell Road and Tattenham Road were built in 1947 and those facing Briar Mead we being completed in 1948. The Playing Field occupies most of plot 178 and a part of 177. Ian I am sure we moved in when I was 5 so that makes the top end of King Edward Rd built 1947 so sounds about right. Well done on your research Nina very interesting I would think there are so many forgotten pre war farms etc. in Laindon. I am glad you enjoyed the field after it was grassed but as I said in one of my comments the day they came along and grassed it all was the day our wonderland disappeared, but I only speak for myself and my friends not for everyone. I do remember the paths were slabs when we moved in, so this was what your poor sister probably fell on, mind you they were great for “Hop Skip and Jump” and “If you tread on a crack you will marry a Rat” are the paths still slabs or tarmac? Thanks Ian. My mum had been a bit vague about the exact position of ‘White House Farm’, saying it was down where the playing field was (waving her hand in that direction). I had imagined from her description that it was on the field itself but often wondered exactly where it had been, hence my enquiries and research. It is very satisfying to find the answers. Now I know exactly where it had been, i.e. at the far eastern end of the playing field where Briar Mead is. (I will scan my copy of the 1947 electoral roll, which shows “White House Farm, King Edward Road” and let you have a copy). The electoral roll must have been taken at the very start of 1947 and ‘White House Farm’ demolished almost immediately after, because as you have mentioned, Briar Mead was built in 1947. So, an awful lot happened there in 1947 and that area of King Edward Road changed completely. Thanks again for your help. Best wishes.